Squirrel! Enjoys a winter snack Dec. 5, early morning. It was single-digit cold this fine sunny morning, and birds instantly appeared after I filled the feeders in back, including a cardinal couple, she being fairly quiet and polite to other birds, he being flamboyant, loud, and a bully. Winter is definitely here in Iowa. No bulbs planted this fall, but that’s OK, I still need to acquire some irises my sister told me I could have sometime in the new year, and I think it’s time to let the gardens “rest” for once and see what comes up. So, of course, my attention turns to trees. 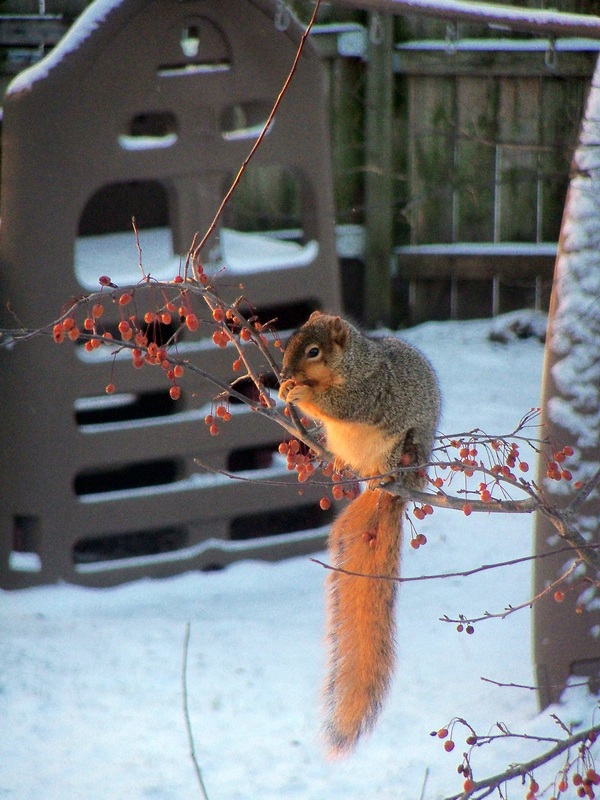 A squirrel reminds us how much pleasure in life can depend on the trees, as it snags a snack of some crabapples. I had written in this blog some months ago about how, several years ago, I planted a package of trees from the Arbor Day Foundation, and what was supposed to be Goldenraintree were instead pears. I really endorse the tree deals from the Arbor Day Foundation—10 trees for $10 is a heck of a deal. If you have some space and an inkling to plant very young trees, see their web site (link in previous paragraph), send them a modest payment, and you’ll get a cornucopia of woodsy plants. Even I, a self confessed tree nut, can’t possibly find homes for all those trees in my over-planted ¼ acre suburban lot. There is a creek bed behind the house, and, in a pinch, I can plant overflow trees back there, but that’s not my first choice, since to plant back there is pretty much to provide snacks to deer. Anyway, I will for sure plant at least one of the Goldenraintrees. I should cut out the pears and plant both of the Goldenraintreees to replace them, but Audrey has balked about removing 12-foot trees and replacing them with 6-inch ones, even if the 12-foot trees might stink in the spring, so I’m not sure my original intentions will come to pass. Well, a plum tree died last year in the lower yard, and its spot will be taken by one of these Goldenraintrees. I’ll also put a Dogwood by the rock wall in the lower garden—just because Dogwoods of yesteryear are either store-bought and alive but not blooming, or long gone to tree Valhalla. I’ll also find a home for the Rose of Sharon, maybe out front somewhere. Assuming no rabbit attacks and that the trees all make in through winter, that leaves me with many orphans to find homes for. And, besides this set of Arbor Day trees, I’m going to be trying to germinate Ironwood over the winter, for no particular good reason I can think of other than I don’t have an Ironwood tree yet, they aren’t huge trees, and I like the name and seeds were readily available from a tree right next to the Warde Hall back door. Cate, Katy, anybody? Want some trees? Right now, they are in planters in back, dormant in the cold, and it remains to be seen which will be alive in the spring. But, if history is any guide—I’ve planted several packs of Arbor Day trees—most, even possibly all, will awaken in the spring. And then they will need homes I can’t give them, unless it’s in the belly of a deer. Besides the Crabapples, Redbuds, Hawthorns, a Dogwood and possibly a spare Ironwood or so (depends on germination), I may have a spare Catalpa tree, too. I planted one in my yard and one in a garden as a replacement if the yard one dies, and if both awaken in the spring, one will have to go. Most of the Arbor Day trees are small flowering, decorative types, and some are partly shade tolerant, so you don’t need to have a huge spot for them—the Catalpa is the outlier. It wants sun and space and can grow to be a very large, full-sized monster of a tree. I’ll update in spring with what still lives, but as soon as school is out in May, I’m willing to visit your house and plant a tree for you. Wow. I owe a thanks to the Arbor Day Foundation. Sent a whiny note to them about the evil trees they sent me. 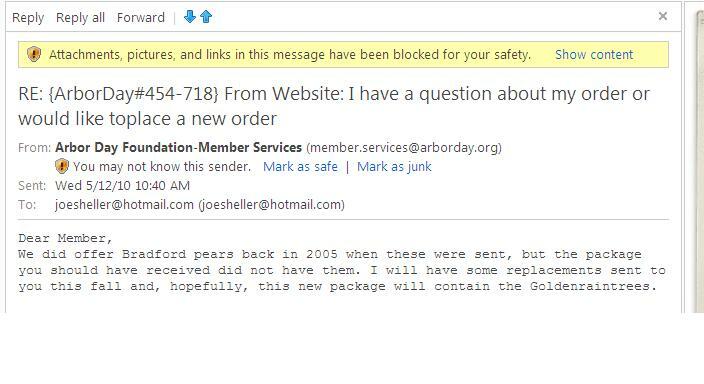 Got this e-mail from Arbor Day. E-mailed them a link to my blog from their web site. They replied very quickly and will send the missing Goldenraintrees. Well, that's about as good as it gets, I suppose. Good folks at the Arbor Day Foundation, and they’re doing what they can, as quickly as possible, to correct the issue I raised. Anybody want 10 trees? I don’t have room for 10 more, but feel like ordering something from the Arbor Day Foundation. And, as I said in my previous blog post, they really do offer good deals. 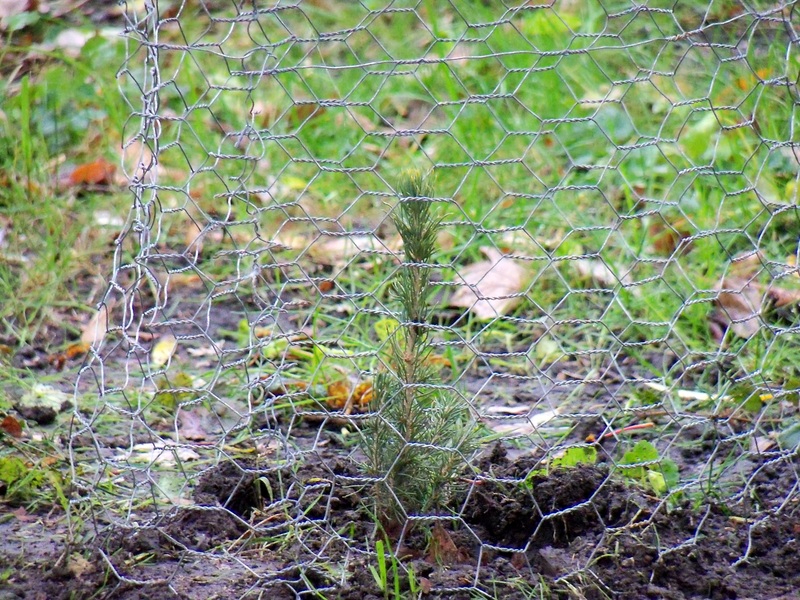 Out of 20 trees planted several years ago, around half survive and are growing nicely. Thank you, Arbor Day Foundation!